The BLUE PRINCIPLES FOR RIVER DESIGN are applicable to any lands that fall within the Chicago River watershed. Each objective has within it keys and tactics for meeting its intended goal. Developments in the riparian zone are encouraged to fulfill as many of the tactics as possible, while watershed properties can embrace variations of each tactic as appropriate to individual sites. For many, the connection between wildlife and water plays an immediately apparent and vital role as it is the primary provider of both food and shelter. It is important to remember that clean water impacts human life equally given our dependence on water for drinking, food production, energy, industry, and play. Not only does clean water have public health impacts but quality of life is interrelated to our access to recreation opportunities both passive and active, the availability of safe natural areas for personal reflection and solitude, and in creating a sense of belonging to a place resulting from a connection to a part of nature. The Chicago River and its surrounding environment provide a unique opportunity for recreation and an increased quality of life for watershed residents. 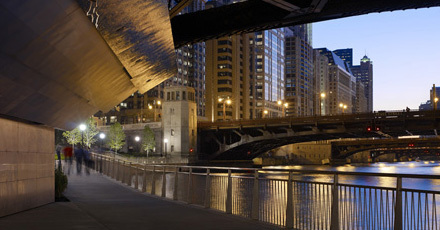 The Chicago River is capable of providing passive and active recreation opportunities in both urban and suburban settings and provides connections for a diverse set of watershed communities. Developers can maintain and restore the quality of life functions by prioritizing river “connectivity” by allowing for or creating continuous paths, increasing links to other areas of recreation, and by assessing both habitat and recreation opportunities in the project area. This demands that strict attention be granted to allowing for smooth movement of people along the river corridor, through the site, through existing or constructed natural areas, and to public sidewalks and other amenities nearby. OBJECTIVE: Maintain or restore the quality of life functions of the Chicago River watershed and its adjacent riparian area. These functions include amenities for active and passive recreation, education, and safe natural sanctuaries. All river walk areas included in the site must be accessible by the public. Provide equal access for all visitors. Sidewalks, trails, and walkways should not dead end except where the safety of the pedestrian would be at risk. All water specific developments, including boatyards and docks, should include docking areas and amenities for non-motorized water craft. Each development should have publicly accessible educational information that interprets the sustainable properties of each site. All historic landmarks and places of historical importance should be preserved. Including enhancements for the enjoyment of the environment in and around a development can benefit the people that live, work, and visit the site. The following techniques can be applied to a site to provide opportunities to enjoy the Chicago River and its surrounding environment. Public Access to Water: At some sites, the slope, intended use, and stabilization of the riverbank allows for direct access to the water by the public. Depending on your site, access can be either formal with built structures or promenades, or more natural such as an unpaved pathway to the water’s edge. Maximize open green space: Green space provides benefits for all of the objectives listed in this guide. Site design should consider the amount of available green space and aim to provide as much open green space as is possible. Connections to existing open green space should also be considered. Providing pathways for plants, animals, and people is key to improving the Chicago River. Establish comfortable, welcoming pathways for the movement of people: These pathways should include access to the street, the river, and all public amenities: allowing public access to your site only works if visitors feel welcome. In order to allow for maximum utilization of this area lighting, public amenities such as benches and water fountains, and safe access should be provided. Provide equally aesthetically pleasing facades from river view: The Chicago River is becoming a truly beautiful and popular local destination. There are thousands of river users that will view your development from the river side. Treating this perspective with the same importance as the front of the building including windows, lighting, access (if appropriate), and façade, will increase the livability, vitality, and visibility of the development. Provide opportunities for active and passive recreation: Optimize the use of the unique river location by creating river focused experiences for each visitor. Enjoyable activities that are river focused can include look out points, environmental education, water features that bring river water onto the property, and benches just to name a few. Take advantage of your location and focus your recreational amenities toward river centric enjoyment. As a major waterway in the Chicago region, the Chicago River acts as a funnel for rainwater and groundwater from the surrounding area. This area, the land that drains into a specific body of water is called a watershed. As the watershed has been urbanized, the ability of the Chicago River to handle the amount of water that falls in this region has been severely compromised by an increase in impermeable surfaces such as roads, buildings, and parking lots. As rainwater hits impermeable surfaces, it begin to accumulate and run-off to the nearest low spot. Runoff collects surface pollutants and delivers them to the river. Because it has been channeled into gutters and pipes, this water gathers enough speed to pick up sediments causing erosion. If not addressed through careful site planning, all of these things lead to a decrease in water quality and negatively impact the Chicago River. In addition to current water quantity issues, global climate change has also been predicted to bring more intense rainfall. This reality demands that future development focuses on retaining and cleaning large quantities of stormwater, then returning it back to the earth where it can then recharge ground water while minimizing stress on river capacity. In order to mitigate the affects of stormwater runoff, developments have traditionally relied on engineering methods, such as extensive underground holding tanks and sheet piling to hold back natural water fluctuations. Green technologies, also known as green infrastructure, are now commonly used to combat the same issues. These techniques include things, such as rain barrels or down-spout disconnections, naturalized detention areas, native rain gardens, porous pavement, green roofs or roof top detention, native landscaping, and bioretention. OBJECTIVE: Maintain or restore the hydrologic functions of the Chicago River watershed and its adjacent riparian area. These functions include providing flood storage, filtration of pollutants, water quality, and erosion control. Provide on site retention for stormwater. Include a landscape architect and civil engineer on the development team to collaborate on innovative and creative uses of green infrastructure. Transform or establish landscaped areas to be almost exclusively native plants. In heavily urbanized areas, the use of non-native plants that are proven to be non-invasive but well adapted to our region, may be considered for the purposes of increasing plant diversity and long-term sustainability of the plantings. All sites should include a five to 10 year long-term management plan for all storm water management techniques installed at site. Discuss management plan with all appropriate stakeholders to ensure longevity and a united vision for the habitat functions of the site. Managing stormwater is a key component of any development. How the site design manages water as it lands on and flows through can determine the amount of buildable area and has a significant impact on cost. Below is a brief discussion of some on-site green stormwater management techniques that can address stormwater concerns and benefit the water quality of the Chicago River. More information and techniques are available at www.chicagoriver.org/chicagoriverblue. Install rain barrels and disconnect downspouts: These methods are one way of diverting rain water from the sewer system. Often times they are most useful in single family residential or small commercial developments where the water can be directed to an appropriate source such as a garden or detention pond. Use naturalized detention areas: This method is used as a holding area for rainwater to collect on a site so that it slows the flow of the water to the river. Traditional practices simply dig a large pond or hole surrounded by turf grass where rainwater collects, a naturalized detention area requires native vegetation and can be incorporated into a more natural site design.. Install rain gardens: This technique is used as a way to provide filtration through the root system of native plants and soils, and can be effective in recharging groundwater. Placed where water collects on properties, these natural gardens can be adapted to sites throughout the watershed. Select porous or permeable pavement: This technique is used to aid rainwater penetration into the soil instead of causing water to flow off of the surface as with traditional concrete and cement. Unlike most pavement, porous pavement is a special kind of pavement that allows water flow through its pores. Porous pavement can be used on any site where contamination is not an issue. Sequester stormwater through roof top detention: These methods are applied to the roof of buildings in order to sequester rain water as it falls. Green roofs are specifically designed to provide water retention and have the added benefits of heat retention to combat the impacts of increased urban heat from reflecting off dark surfaces. Rooftop systems are used primarily in commercial and industrial developments and are particularly applicable in contaminated sites where infiltration is not desired. Use all native plant species for landscaping: This technique is used to increase the water storage capacity of the site by using all native species which have evolved to local conditions and can therefore hold extensive amounts of water and withstand local weather patterns. Native plants also provide local habitat and food for native wildlife and create enjoyable public space for visitors. The use of native plants in a site plan is appropriate for all developments including residential, commercial, and industrial. Conserve and protect soil during construction: Healthy non-compacted soils provide increased filtration of water pollutants, increased ability to retain water and support native plants that also store water, and reduce erosion from run-off. Soil protection is appropriate for all developments, including residential, commercial, and industrial and provisions for protecting soils should be considered during construction, and post construction. Create physical water connections between the site and the river: When it is possible to direct clean rainwater from the site, consider providing a meaningful physical connection that can be designed to improve the hydrology of the river and provide habitat, educational, and aesthetic benefits. The Chicago River is a major corridor for terrestrial and aquatic organisms. The Chicago River is home to 70 fish species, 60 species of birds, and abundant populations of reptile and amphibian species. Mammals that rely on the river include the otter, beaver, fox, and coyote to name few. Forty years ago fish and wildlife were almost non-existent on the Chicago River; it is the success of improvement projects undertaken since then that gives us something to protect. As the amount of available, quality habitat increases throughout the Chicago River watershed, the return of other native populations will continue. In order to maintain and enhance the ecological functions of the Chicago River, habitat improvements should be focused on creating environmental buffers; contributing to riverbank stabilization; and providing fish, turtle, invertebrate, and bird habitat. In addition, connectivity between aquatic habitat and the adjacent land should be enhanced and strengthened to support, protect, and increase habitat areas, land and aquatic habitat alike, along the river. In order to be successful in these endeavors, each site must manage invasive species. Invasive species constantly threaten to take over natural areas by minimizing diversity and monopolizing resources. Planning standards on the river edge that accommodate both development needs and habitat is not yet as common as it should be. However, this document will provide you with resources to be successful in this endeavor. OBJECTIVE: Maintain or restore the native ecological functions of the Chicago River watershed and its adjacent riparian area. These functions include habitat provisions that increase biodiversity and mitigate climate change. The total amount of habitat per site should be maintained or increased, a decrease in total habitat is has a tremendous negative effect on the health of the river. Wherever possible, sites should consider in-stream habitat provisions. The development team should include a pre-qualified stream bank contractor. All sites should include a five to 10 year long-term management plan for all habitat techniques installed at site. Discuss management plan with all appropriate stake holders to ensure longevity and a united vision for the habitat functions of the site. River-edge habitats of the Chicago River support a diverse and varied collection of fish, aquatic animals, birds, and insects, though habitat creation is not limited only to river-edge properties. Some sites hold more potential than others and selecting habitat features for each site will be dependent on the intended use of the property and the type of river-to-land connection present. The river- to-land connection is the way the land meets the water whether this is a natural slope, a sea wall constructed of steel, or a combination of both. Usually, the river-to-land connection is present prior to site planning, and will be a major deciding factor as to the habitat techniques selected. Watershed locations should compliment the existing neighboring habitat or strive to create new habitat onsite. Below is a list of techniques for maintaining appropriate habitat functions on the Chicago River. Accommodate for and install a native plant buffer: The area that connects the water edge to the surface should be buffered by an area that utilizes native vegetation to enhance habitat. This area should be as large as feasible. The native buffer area should not be used for development other than specific amenities for public access. Many areas along the Chicago River are infested with invasive species that threaten the available habitat, food, and ability to retain storm water from your site. The buffer area should be surveyed for species and restored to a natural diversity appropriate to your area. Install a Fish Hotel: Constructed much like a floating dock, the Fish Hotel supports underwater structures that provide fish habitat, submerged planting beds, and a native garden habitat above. Fish Hotels are a great opportunity to draw in the curious public for viewing of these small natural oases. Fish Hotels are particularly important in areas of the Chicago River where fish habitat is non-existent such as seawall lined areas. Many of the techniques utilized to create the fish hotel can be installed in smaller structures such as fish cribs and lunker boxes. Landscape with a diverse group of native species: Native species are indigenous to this area and have evolved to withstand local soils and climate patterns. Native species provide essential food and habitat and should be used for landscaping throughout the development. Using a large diversity of plant species will increase the habitat benefits of these plants. The versatility of native species allows for more formal plantings and can alternatively be planted for wild, natural settings. Protect and restore wetlands: In the past, development sites that were previously wetlands have been filled, paved, or regraded. These areas often have soils that indicate a wetland area. Wetlands are systems that provides unique and essential habitat for various species including many endangered or threatened species. All current wetlands must be maintained and areas that were previously wetlands should be considered for restoration. The Chicago River watershed has the potential to be a fully embraced resource that teems with schools of fish and groups of paddlers, suburban birdwatchers and innovative green infrastructure projects. It is returning to a river that provides sanctuary for the thousands of migrating birds and a safe haven for the return of otters, minks, muskrats and beavers. Let us envision the Chicago River as a recreational adventure from the Skokie Lagoons to the little Calumet River. In suburban areas, envision sites that have rolling slopes to water’s edge with boat access and community stewards who manage ongoing water conservation and educational sites. In the urban sections, imagine a metropolis above with small oasis hideaways that attract visitors who peer over the edge to look at the aquatic life below. Imagine maps to a connected river trail for bikers and hikers that guide people for miles through a montage of changing landscapes, buildings, and preserves. All of these visions are possible, and all are within reach. Chicago River Blue will create a unifying goal that not only dreams large but gives developers the tools to make it happen.